We’ve all been there: you’re sitting in a restaurant, sipping on your carefully chosen bottle of wine that has been poured straight from the bottle into your glass. Out of the corner of your eye you notice the Sommelier - hidden in a corner - carefully pouring another table’s wine into a decanter. The decanter is then carefully taken to the other table and their wine is dispersed amongst the guests, their faces alight with anticipation and expectation. The truth is that the decanting of wines is often misunderstood and, as a result, many wines are decanted that probably don’t require it, and, on the flip-side; some wines that probably could have benefited from some time in a decanter are overlooked. In the era of modern wine making, most wines made for everyday drinking probably don’t need to be decanted before they are devoured. Most modern, easy drinking, fruit-forward wines are cleaned up in the winery (or ‘clarified’) through a combination of fining and filtering, to ensure that when the bottle is opened at the table it is in pristine condition and ready to drink immediately. But I own a decanter…I want to use it! Fret not. For both the wine lover and the wine professional, the decanter remains an essential piece of equipment. Thankfully the diversity of the wine market means that there are still wines that benefit greatly from some time in a decanter. But why do some wines need decanting and, more importantly, what is the best way to decant your wine to ensure that the lovingly-produced drop is being drunk in its optimum condition? Perhaps the most obvious reasons for decanting a wine is to remove any unwanted deposits that may have formed in your bottle (something that is particularly relevant when venturing into the world of older, treasured bottles). When delving into the world of fine wine, and whilst dabbling with some more artisanal producers, there is a tendency to produce wines that are unrefined and unfiltered. In their youth these wines should be relatively clean and shouldn’t throw up a huge amount of sediment (but could still benefit from decanting). However, over the course of time, deposits will form and careful decanting is a necessity. Not only displeasing to the eye, anybody who has accidentally sipped on a wine with excess sediment will know that it is also rather displeasing to the mouth. With older wines it is advisable to pull the wine from the cellar and stand them on their end for several hours before decanting. This should ensure that the sediment collects in the bottom of the bottle giving you greater chance of preventing any unwanted sediment eventually making its way into your glass (and eventually your mouth!). Decanting older wines and wines that throw up a sediment requires a steady hand. The aim is to separate the wine from the grainy sediment formed in the bottle. 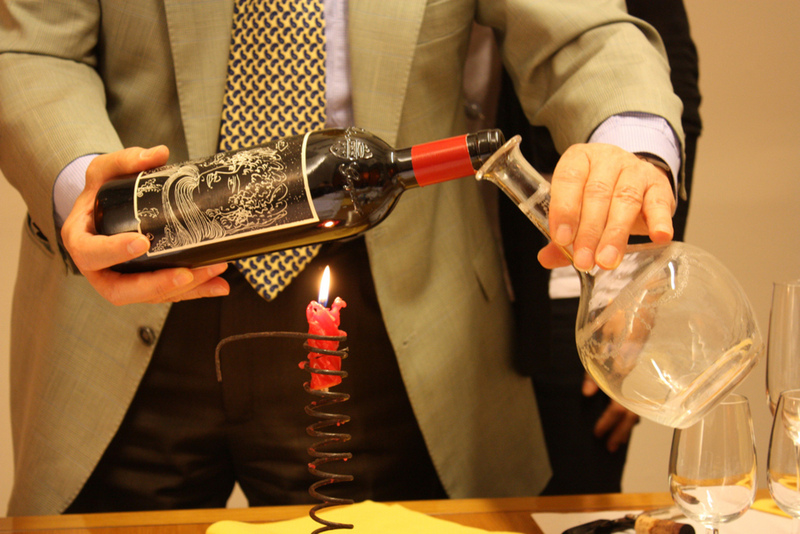 Hold your bottle over a light (traditionally a candle is used but a simple household torch will do the trick nicely) so that when pouring you can watch the sediment slowly move up the bottle. The steady hand is important here as you are looking to pour the wine into the decanter in one smooth, slow pour to try and avoid the sediment getting mixed up with the wine. Once you see the sediment approaching the neck of the bottle stop pouring. It might seem like a waste but the small amount of sediment filled wine left in the bottle is best left for cooking purposes only! Decanting younger wines is something of a bone of contention within the wine world. There are some that feel it has little influence on how the wine drinks and believe that pouring into suitable glass wear will do the trick just as well as decanting. If you’ve got the time and the tools then giving younger wine a quick whirl in the decanter certainly won’t do any harm and can help get a bit of air around the tightly wound young wine (and may even help soften out some of those slightly aggressive tannins). When opened, some wines may also give off a bit of what is affectionately known as ‘bottle whiff’ (more technically known as reductive characters) and decanting can give these wines the opportunity to tidy themselves up a bit before being served to thirsty friends and guests. You don’t need to be as gentle with younger wines, so don’t be scared to pour into the decanter with a bit more vigour! Is that a white wine in there? Fuller bodied whites, mostly those that have seen some period of wood ageing or have been nestling away in the cellar for a while, can also benefit from a quick decant before serving - so don’t be scared to give your top shelf Margaret River Chardonnay a decant before pouring it out. Often the biggest benefit being that these more compact, richer wines are often served slightly too cold and a stint in the decanter should give them opportunity to come up to the correct drinking temperature. Decanters need not be expensive (or even really decanters at all!). A simple jug picked up from an op shop should be as effective an elaborate antique crystal decanter but there are some glass makers that specialise in sculpting some stunning decanters and are well worth looking out for if you are building a collection of wine paraphernalia to adorn you dinner table. 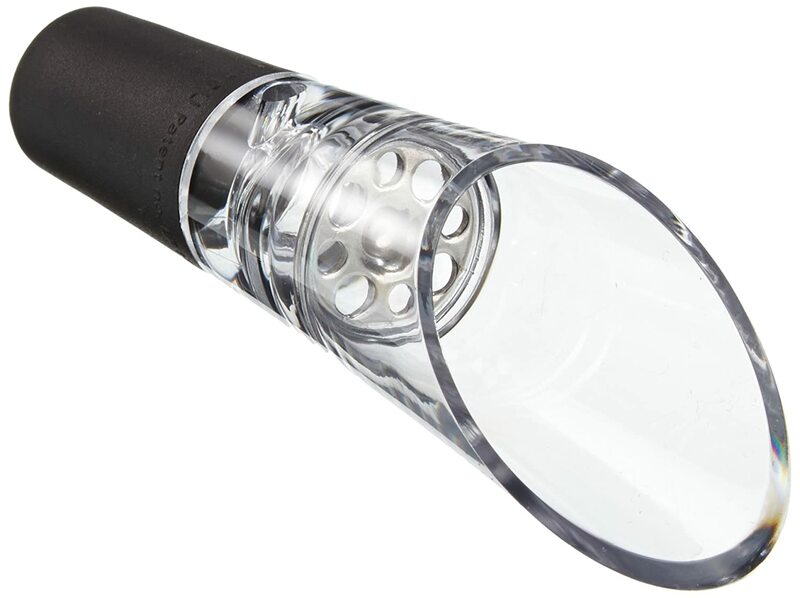 Also on the market are a number of other tools designed to aid the decanting process such as funnels, strainers and aerators which can be useful but sometimes the steady hand and another bottle of wine can be a wiser investment.